On Tuesday, Vladimir Putin, the Russian President has instructed the govt, to develop visa-free travel for the short term visits and also transit by the foreign tourists from the BRICS nations. To submit the proposal, the deadline is for 30th October. 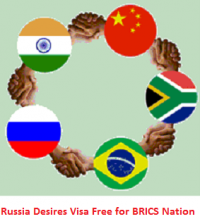 The BRICS bloc does comprise of 5 developing economies such as Brazil, Russia, India, China and South Africa. The Russian President has asked to make varied legislative changes that would increase the number ports in Russia which would allow the sea foreign travelers to enter Russia. The idea of the visa-free travel within the trade bloc was initially proposed in the year 2013 at 5th BRICS summit in South Africa, Durban. For business people, from BRICS it has already provided easier access to the nation, said Malusi Gigaba, South Africa’s Home Affair’s Minister in February.